Inspired by a thought-provoking conversation with a good friend over a glass of pinot noir. GenBeauty brings together the top online beauty and fashion creators as well as big beauty brands for an exciting weekend of inspiration and networking. In the past, as an ipsy employee, I've worked the event in Los Angeles and New York City. I've checked eager ipsters into the venue at registration. I've worked the information booth, and I've done line management for several brands. 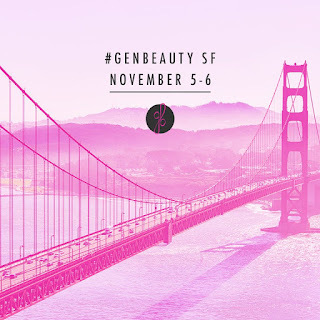 This time around, I have the opportunity to simply enjoy the event and attend as a Beauty Creator, which I fully intend on doing. My only hesitation is that I need to mentally prepare myself because the thought of approaching strangers and networking has always terrified me. This may come as a surprise to many of you, considering that I create content for a variety of social media outlets that I post publicly for the world to see. As an introvert, I tend to consciously prepare myself for social interaction, especially if I know I'll be surrounded by people that I've never met before. I've met a few of my YouTube subscribers before, and it was definitely an enlightening and uplifting experience. It's amazing to see myself through the eyes of others. I'm so grateful to see how I've influenced the lives of my YouTube subscribers and readers. Though I'm eager to meet all of you, I'm naturally just more in my head in certain social situations. I know I overthink things too much. I don't want to come off awkward and painfully shy when I meet new people and that anxiety is what makes me so afraid. But I know that it's a risk that I need to take for my personal development. I'm slowly learning to take more risks in life. When a new opportunity presents itself, don't sabotage the experience before it has even happened. Approach new opportunities with positivity and enthusiasm. Smiling and looking my best always gives me an extra boost of confidence. You know when you look your best, and getting compliments and smiles from others around you will only validate that feeling even further. It's easier for others to approach someone who appears warm, energetic, and happy. When you match that energy, you're naturally drawn together, making the first impression you make on one another feel effortless. After the initial small talk subsides, you'll need to find more ways to connect. Consider what you want to learn from the new people you meet and have questions ready to ask. What brings you here today? How did you get started? What inspires you? As the other person is speaking, be sure to also listen and ask any follow up questions if necessary. If you're actively listening, there's less time for you to withdraw into your head and overthink what you're going to say next. Don't feel ashamed if you have to practice talking to yourself to calm your nerves and gain more natural charisma. I do it ALL THE TIME! You should also consider your answers to these questions and think about everything you want to share about yourself. You shouldn't rely too heavily on the other person to keep the conversation going. Accept that we're all human. Majority of the people you'll meet feel just as anxious as you do. Instead of dwelling on your fears, think of how much better you'll feel once you've broken the tension. The person standing in front of you may not know anyone either. You're not helping anyone by suffering in silence. It may be scary, but think about how much you have to gain. Someone who was once a stranger can become a new friend and open a whole new world of knowledge and opportunity for you. Don't be scared! Take a risk! Introduce yourself, make your presence known, and make new friends. I'm sure it will be worth it in the end.